"Next twenty years will be about gas." 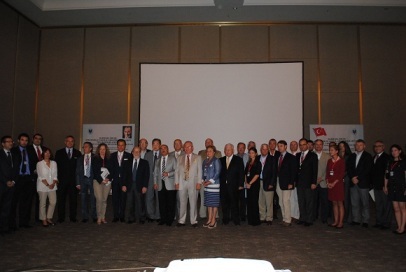 The Marmara Group Foundation a roundtable discussion titled “Would the ‘Arab Spring’ be a ‘Consumer’s Harsh Winter’?” on September 15 at the Wow Istanbul Hotels and Convention Center. The discussion featured the Dr. Hilmi Güler, the former Turkish Minister of Energy and Natural Resources, acted as moderator. The discussants were Necdet Pamir, a leading energy expert Edward Chow, Senior Fellow in the Energy and National Security Program at the Center for Strategic and International Studies (CSIS), and Dr. Bülent Alirıza, Director of the Turkey Project at CSIS. The discussion focused the most recent developments in the MENA region, particularly the Arab Spring, and their impact on the energy environment of Eurasia and Turkey. The event was inspired by the fact that many countries that produce, transit and consume oil and gas are located in a region that has seen dramatic upheavals over the last 22 months. The stated goal of the event was to feature a discussion between prominent experts in the energy security field that could develop a better understanding of how regional and global actors’ interests and policies can influence tomorrow’s energy security environment. This event was also meant to serve as a precursor to the 16th annual Eurasian Economic Summit that will be held April 9-11, 2013 in Istanbul. Dr. Hilmi Güler, began the conversation by condemning the recent attacks on US embassies throughout the Middle East, particularly in Benghazi where the ambassador was killed. “Barak Obama's foreign policy is in tatters and it may affect the election outcome. He has no idea what to do," said Aliriza. Edward Chow, a part-time instructor at the Elliott School for International Affairs at George Washington University, said, "Next twenty years will be about gas." "Oil prices are suffering not just because of Arab Spring. No country that had a revolution was then followed by an increase in oil and gas production," said Chow.